Properties in North Dorset District average 4.5 out of 5 stars. Property 14: BEAUTIFUL BOUTIQUE HISTORIC COTTAGE! Property 20: Beautiful stone barn in stunning rural location on Dorset - Somerset border. 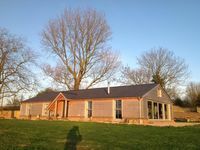 Magna Cottage is a 300-year-old self catering holiday rental in a secluded valley in Dorset. Property 48: Magna Cottage is a 300-year-old self catering holiday rental in a secluded valley in Dorset. What a beautiful place to spend a few days, a perfect base for us to visit family and enjoy Shaftesbury. We had a wonderful stay at The Piggeries. We were 7 adults and we had plenty of room. Everything felt clean and new and it was great that each bedroom had its own bathroom. The views are incredible across the Dorset countryside and it was a perfect base to explore the surrounding area. We would definitely stay there again.